“I am a reluctant Venetian, though I do acknowledge the very strong ties I have with the city where I was born and raised. Especially today, because I feel good in this home-studio at Giudecca, the island closest to the historical center, a reclaimed place separated from the tiresome hordes of tourists, from which it is easy to reach the glassworks of Murano or the rail station, Piazzale Roma and an escape route,” says Laura de Santillana in this interview that offers a glimpse of a diary of her human and professional progress, through an exegesis of her personal habitat project. The first time the artist – grand-daughter of Paolo Venini, the founder in 1921 of Venini on the island of Murano – set off from Venice was during adolescence, after classical studies and one year of Architecture at the Iuav University of Venice. Her destination was New York, where she studied at the School of Visual Arts and worked in the studio of Massimo and Lella Vignelli. When she returned to Venice she spent five years, with her father Ludovico Diaz de Santillana and her brother Alessandro, in the family business, Venini, the brand-emblem of the finest Italian tradition in the field of artistic glassmaking. Until 1985, the year of the painful sale of the company, and a turning point. She returned to the States, where first in New York, at Urban Glass, and then in Seattle, in another research center, she experimented with innovative techniques, different from the traditional glassblowing methods of Murano. The discovery of the home-studio at Giudecca came by chance. “I already had a studio at the port, behind the cruise terminal,” she recalls. 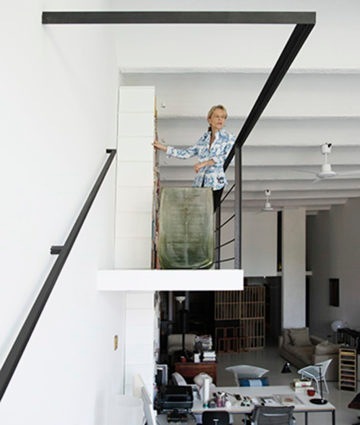 “But when they suggested that I visit this loft, which was already a residence, I was fascinated by the renovation the architect from Berlin Andreas Brandt had done for himself in the 1980s. A beautiful project: clear, simple, radical. An open loft with a balustrade, overlooking an uninterrupted space, a single large volume filled with echoes of Viennese modernism. For several years I kept it like that, as a studio. I enjoy the open, luminous spaces, the high ceilings. This unit faces east: light floods in through the large window and fills the room. It is an ideal place for a dialogue with glass. Later I moved here, retransforming the place as a residence. It was a renovation of a renovation. Giovanni Leone, an architect and an old friend, helped me to create new rooms, closing the kitchen that was previously open, adding dynamism to the orthogonal layout with a slanting partition. Looking back, I realize I have always lived in such lofts, expansive, quiet, with natural, neutral, restful colors, where everything is free to find its place. In that landscape today there are design classics, fine Nordic pieces, coexisting with memories, objects of affection: glass, of course, family heirlooms, plates in ‘glass mosaic’ designed in the 1970s, objects purchased during trips to the East, India, Japan. 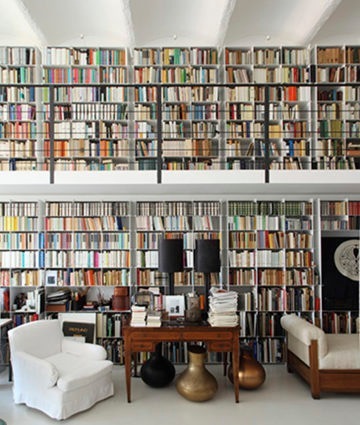 And many books, organized in a two-story bookcase that has the role of a catalyst. “I have gathered the books of a lifetime: those of grandparents, great-grandparents, my parents and those of my partner, and the catalogues I have designed for my exhibitions,” Laura de Santillana says. “There’s a bit of everything: literature, history, religion, esoteric works, poetry, novels. Reading, especially at night, can really take you elsewhere. Like travels, and like glass.” In a sort of parallel arrangement with the bookcase, this viewpoint is conveyed by a series of 40 glass books, displayed on a sort of bookcase of their own which the artist has created using compression techniques, which squeeze the air out of the glass and put its physical characteristics to the test. 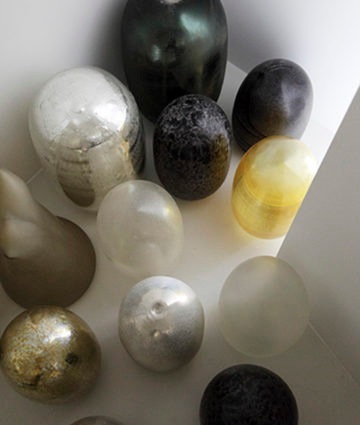 They are large slabs resembling sealed envelopes, overturning the tradition of blown glass. Their story is written inside them: the risky and complex workmanship, exercises of prowess on the part of the makers; transparencies penetrated by light, a sense of captured fluidity, dynamism; of the creative process. “For me there is a first phase of thought, not necessarily drawing, that corresponds to the development of an idea and an atmosphere. A solitary process. This is followed by experimentation in the factory: tests on a small scale in crystal, without color. I refine the proportions, sequences, thicknesses, the quantity of the material: all information that is passed on to the master glassmaker. Finally comes the study of the color. I always work by means of overlays, dipping, insertions, glazes, nuances. Unfortunately the pure color in fusion has become standardized, while instead it would be possible to do amazing work on colors. In the meantime, in Stockholm, until 16 August, Galleri Glas presents a solo show by Laura de Santillana, while in Kyoto, from 5 to 8 October, Genbei Kondaya will show her works in glass and bronze together with textiles by the Japanese artisan Genbei Yamaguchi. The exterior of the red brick building on the island of Giudecca, location of the home-studio of Laura de Santillana. 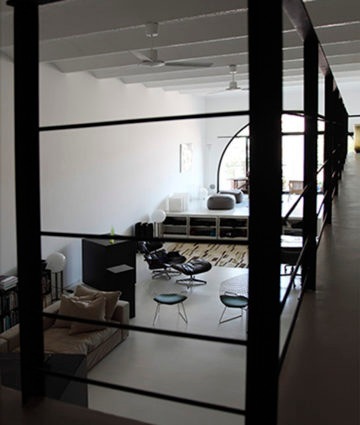 A loft on two levels, with a footbridge-belvedere open to the unified space below. The furnishings include design classics like the Lounge Chair by Charles & Ray Eames (a 1960s original) and the Diamond chairs in metal mesh by Harry Bertoia (Knoll International). Sofa by Boselli. The white spheres are lamps by Roberto Menghi for Venini. Portrait of Laura de Santillana. View of the two-story bookcase that makes optimal use of the height of the space, becoming a protagonist of the domestic landscape inhabited by memories and items of affection. On the desk, black lamps in glass and lacquered wood by Laura de Santillana. Under the desk, Bodhi creations in glass and bronze. 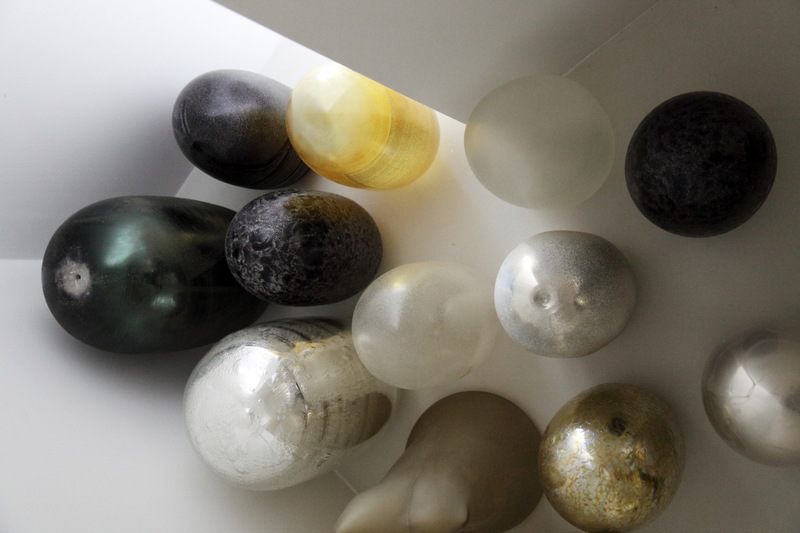 Factors that form the art of glass of Laura de Santillana: the sculptures of the Cosmic Eggs. 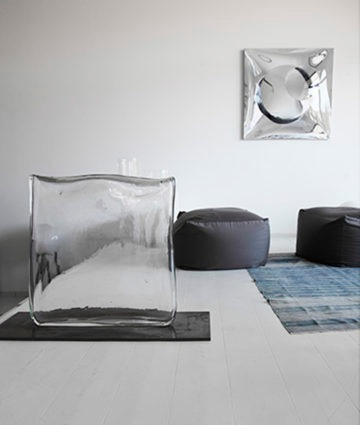 Bodhi, a large book in crystal. On the wall, a work in blown PVC by Franco Mazzucchelli.